The others were accused of links to the al-Qaeda linked Somali Islamist group al-Shabab and their supporters accused the government of being behind their killings – charges the authorities denied. 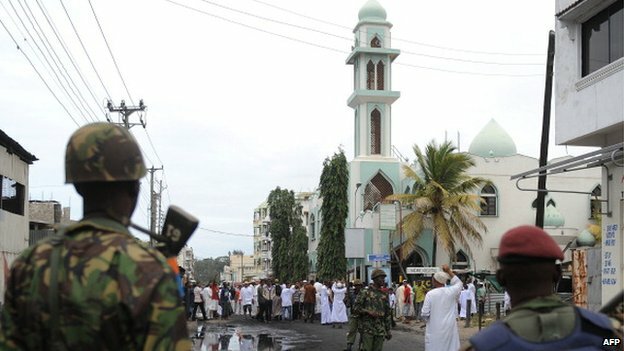 “There was a power struggle at Sakina mosque – where he was supposed to be installed as a sheikh – between his supporters and another radical group opposed to him,” Mombasa’s police chief Robert Kitur told the AFP news agency. Before he died he had said he supported the group’s attack last September on the Westgate shopping centre in the capital, Nairobi, when 67 people died. His supporters blamed Kenya’s Anti-Terror Police Unit (ATPU) for his killing. Correspondents say it is not clear whether the ATPU was involved in the shooting but late last year an ATPU officer told the BBC the police had lost faith in the courts and preferred instead to “eliminate” terror suspects. Posted on 10th June 2014 by newsafrica. This entry was posted in Africa, African Security, al Qaeda in Africa, Al Shabab, Christainity, Democracy, Islam, Kenya, Religion, Terrorism and tagged al-Qaeda, Al-Shabaab, BBC, Kenya, Mombasa, Muslim, Nairobi, Ulama. Bookmark the permalink.